Few programs are as important to the construction industry as training, and no one trains carpenters like the Carpenters Union. The Carpenters Union focuses on helping all carpenters, whether they've been working in the industry for thirty years or they're just getting their start. We're committed to providing well-rounded carpenters across the entire range of building disciplines. Check out the schedule of classes being offered this fall and winter in Connecticut to find the class and schedule that? ?s right for you. With 22,000 well-trained men and women across New England, we guarantee a deep pool of qualified workers for every type of project. Our apprenticeship proram continues to generate the workforce of the future. 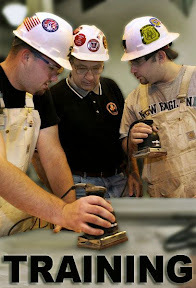 More than 6,000 carpenters are taught each year by nearly 100 expert instructors at our training facilities throughout New England. Those apprentices graduate prepared for a career, not just a job.